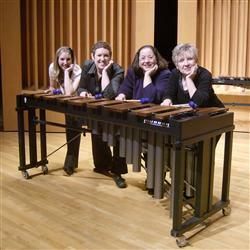 Chix with Stix Percussion Group brings together a group of female percussionists who express their musicianship through the performance of new and traditional percussion ensemble repertoire. They have taken on roles as performers, mentors and educators as they strive to bring this genre of music to a wider audience. They are keenly aware of the value in providing a strong role model for today’s young percussionists. Since their debut performance in January 2004, Chix with Stix has been entertaining and educating audiences of all ages. The musicians, Lisa Angert Morris, Karen Hunt, Olivia Kieffer, and Courtney McDonald have a combined 50 plus years of freelance experience throughout the Southeast. Chix with Stix has performed at Reinhardt College, the Georgia Percussive Arts Society Day of Percussion, Jacksonville State University, Georgia College and State University, Perimeter College, the Big Canoe July 4th Celebration and were invited soloists with the Atlanta Concert Band. They were featured with the Columbus Symphony Orchestra and took part in the Percussion Extravaganza in Gainesville GA, and they traveled for an educational tour in Jacksonville AL. As well as being active performers and educators, Chix with Stix includes a licensed psychotherapist, a college music teacher, a symphonic percussionist, and a small business owner.